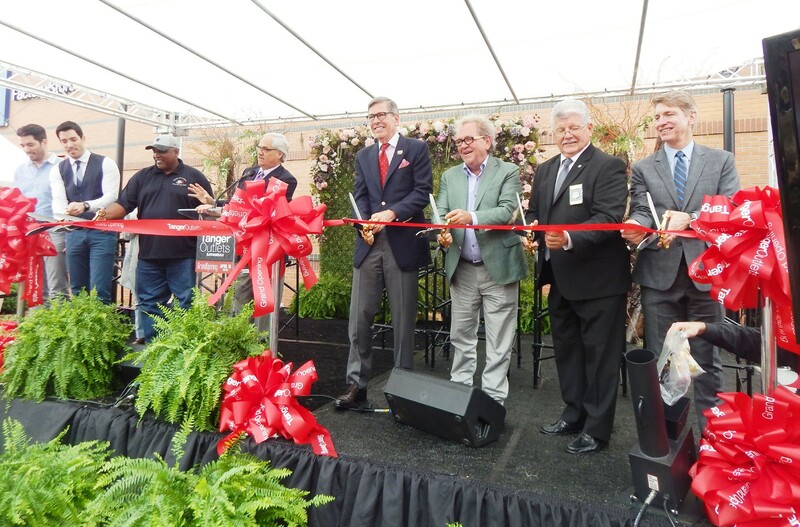 The new Tanger Outlets Savannah held their ribbon cutting ceremony and officially opened last Thursday in Pooler. The Outlet is located just off I-95at the Savannah Hilton Head International Airport exit. It has more than 85 stores presently and is 95% leased. The outlet mall project is a partnership with Ben Carter Enterprises and Tanger Factory Outlet Centers and it becomes Tanger’s 44th mall in 24 states and Canada. HGTV’s Property Brothers Jonathan and Drew Scott joined developers Ben Carter and Steve Tanger in officially opening the new mall. Quito Anderson, CEO of Ben Carter Enterprises pointed out several features of the outlet that represents the Coastal Empire including the Lighthouse, tabby walkways, ghost writings on the side of the buildings, even the belt lighting which creates an inviting space. Carter, an Atlanta native, is also working on a mixed-use revitalization currently involving 37 buildings along Savannah’s historic Broughton Street. Tanger Outlets Savannah in Pooler is expected to employ about 1,500 workers. Regular Hours are Monday – Saturday, 10:00am – 9:00pm and Sunday11: 00am – 8:00pm.